In the past few months there has been an alarming increase in knee and ankle injuries to youth and adult soccer players at the Polo Fields in GGP. Not particularly a new issue, but reaching a crisis point again. Most disturbing is word that for want of a part to repair a critical piece of machinery, the 2 month scheduled restoration period, to begin June 12, can do little to remedy the problems of collapsing gopher runs, warn out areas, inconsistencies in soil compositions and irrigation. I’ve been told that RPD can’t or won’t find the money to pay for the part. The problems at the Polo Field are chronic, but without an institutional memory, the same mistakes can only be repeated. 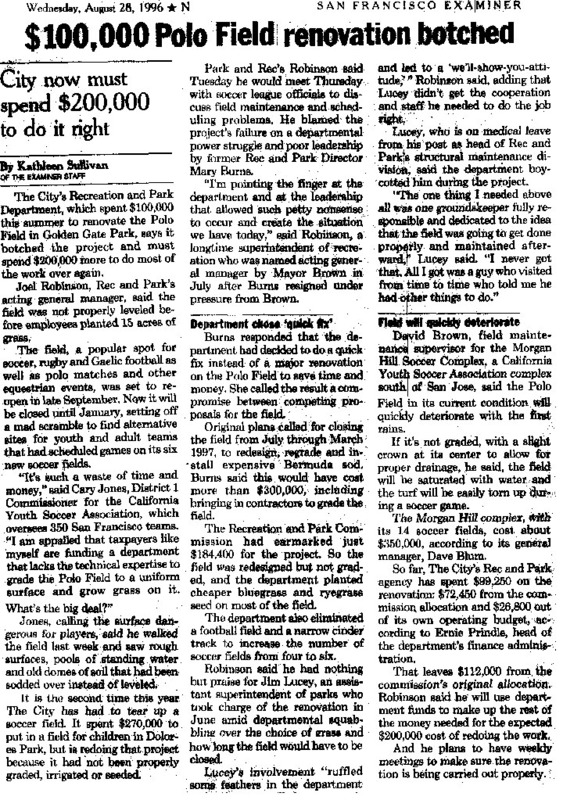 Mayor Newsom’s “cleaning house” and bring in “a new guard” to manage Rec and Park, has retired or chanced off most if not all of the staff that could have spoken to the chronic problems and maybe lead to positive solutions. a under privately funded 1890 attempt to create a race course for the wealthy to show their thoughbred horses. But after 15 years, John McLaren choose to take the race track back, creating upper and lower Speedway Meadows and opening the Stadium Grounds in July of 1906. The 16.5 acres of central lawn were to be used for field sports – rugby, soccer, lacrosse, football, and the like. That was ringed by a bicycle track, which was eventually banked for motorcycles. Beyond that is an embankment, which is today home to a thousand gophers, and that is ringed by a horse and carriage racetrack. In its day it was not uncommon to have all these activities going on at one time, therefore two pedestrian tunnels were provided to access the center with the horses passing overhead. In 1912 the Park Commission approved the beginning of a grand grandstand that would ring the entire complex, making it the largest stadium in the world. A first section was constructed, but after the Park Commissioners stood at the top and realized how far they were from the field, one exclaimed that binoculars would have be issued to patrons and the project stopped there. Of note, this remenant of a bad idea was briefly used to store miniature boats for Speckel’s Lake, and then used as temporary stalls when the stables were added. As they are very small stalls, only small horses or ponies fit. Recently the stables were closed and as work was to began to restore them, and demolish the grandstand, preservationists raised a claimer and have forced an Environmental Impact Report on the historic significance of the structure. When noted that this is a grand example of man’s folly in the Park, a friend noted that we have much more recent and grander examples of non-conforming use of the Park in the Easter end. Rec and Park are being forced to find $60,000 to fund the EIR before repairs to the stables can began and horses return to the Park. The “Stadium” has served as a venue for special events throughout it’s history. In 1915, the Ground Breaking for the Pan-Pacific Exposition were held at the Polo, but only the by valiant efforts of John McLaren was it bared from the western end of the Park and moved to the Marina. It found usas an early runway for early flight. During the Second World War, citizens of San Francisco lined up at the Polo to walk before a movie camera. The film was then distributed to the troops oversees and solders could have a brief glimpse of family back home. This event almost didn’t happen as the Red Cross requested permission to change admission to the event, but this violated a park code baring such collections in the Park. Times have changed. Most remember the Polo serving as a venue for large outdoor concerts. The grandest of course the memorial for Bill Graham drawing well over 100,000. The field and track have received maintenance and renewal throughout it’s history, BUT with Prop 13, “The Tax Payer’s Revolt” all it received for 20 years was minimum mowing and watering. By the early 1990’s the condition had deteriorated to the point that it became too dangerous for competitive sports or polo. But these were the days of the explosion in youth soccer and the weekly media reports on “soccer mom’s”. An adhoc committee of adult and youth soccer coaches formed to decry the conditions our players faced at Polo and every SF field. A under-funded attempt at restoration was begun in 1995, but without funds for even grading, it wasn’t going well. 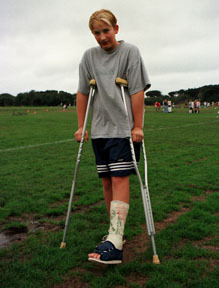 That August a 12 year old player severally broke his ankle. I took his picture along with a picture of the hole he had stepped in and had it placed under Mayor Brown’s nose at one of his Saturday one on one’s. A week later, money for our fields began to rain down. The merger attempt at restoration was sprayed with herbicide then the entire field scrapped and graded and an entire new surface of sod applied. Cost about $400,000. In the spring of 1996 “Polo” reopened as the best complex of soccer field anywhere in the United States. The ground sports community were in heaven. But as was screamed from the rooftops, MAINTENANCE, maintenance, maintenance. To this end Rec and Park purchased a device called a top dresser. Basically they fill it with sand or dirt and pull it around the field and it spreads the material evenly. At the same time, the gopher population that had left the field proper during restoration, moving in mass to the banks surrounding, lust after the new lawn. They cross the bicycle track and start digging. For a few years after sodding, maintenance staff would inspect the field and as all gopher activity was new, they would immediately trap or pesticide the individual gophers who weekly with attempt to move back. Additionally, irrigation at Polo has always been difficult due to prevailing winds. What would be “head to head” coverage on calm days, missing large areas on typical windy days. This requires gardeners to drag water lines sometimes hundreds of feet if adequate watering is to be effected. All of these efforts require diligence from a consistent staff and even greater support from supervisory staff. Both of which have been in very short supply at Rec and Park. In late Fall, some of us in the soccer community again started screaming about conditions. A meeting was held out on the fields at Polo, promises made, and a private firm hired who trapped 300 gophers in a few weeks time. But the damage is done. The complex of tunnels these varmints have dug continually collapse, creating a minefield of holes waiting to turn ankles, or worse, knees. Additionally, the network provides ready “housing” for the thousand or so gophers that reside on the banks around the fields. Only by repeated top dressing and rolling can these be fully collapsed and filled. Such restoration can only be affected over an extended closure as grass needs time to re-grow, particularly when started from seed as required for all the bare areas. Such a closure is scheduled to began June 12th throuth August 5th. But without the part for the top dresser that Rec and Park can’t afford, little can be done. For want of the horse the battle was lost. In late April, RPD could find $153,415 for cost overruns on the Harding Golf Clubhouse to chase the $395,000 in overruns already paid out. I have confirmation from Central Shops that the Top Dresser belt has been purchased and air freighted. Estimated arrival date is tomorrow. In anticipation of the belt arrival, the Top Dresser is in the equipment bay in the Structural Maintenance Yard today being prepped for the belt replacement. Turf Management will need the Top Dresser to be operational no later than Monday, June 19. We feel very confident that we will meet that schedule. Once the field is closed (next week), the field will be irrigated and then aerated. The repaired Top Dresser will commence laying down new soil (approximately 150 cu. yds) and up to two tons of new seed for overseeding. In particular, the new soil application will improve the grade differential throughout the field surface. 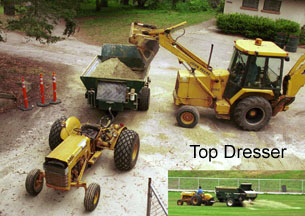 We have also scheduled fertilizing (up to two tons) and we may install a limited amount of newsod as well.In a coordinating piece, we will try to schedule core aeration of Monster Park turf so that the hybrid Bermuda Grass aerated cores can be trucked to Polo Field and applied with the above top dressing. Our gopher eradication efforts have been aggressive and, to date, we have removed well over 300 gophers from the playing field and surrounding banks.